EDF Renewable Services' Spinning Spur wind power project inTexas is not only large, it also has a big backer in Internetsearch giant Google. They do things big in Texas, andthe Spinning Spur wind project located in the state's panhandle 30 miles west of Amarillo is just one more example. The project actually involves three spurs. Spinning Spur I, owned originally by Cielo Wind Power (Cielo), was completed in 2012. On a site that spans 28,426 acres, 70 Siemens 2.3 MW turbines were installed to produce 161 megawatts. Wanzek Construction was the EPC on that project. Also completed in 2012, construction of Spinning Spur II was nearly identical to Spinning Spur I. Again, Siemens 2.3 MW turbines were installed to produce 161 MW, and the parties remained the same, except that Mortenson, rather than Wanzek, was the construction company. In 2012, EDF Renewable Services purchased Spinning Spur I and II from Cielo and began work on Spinning Spur III. This 194-MW wind farm is scheduled for completion in 2015. 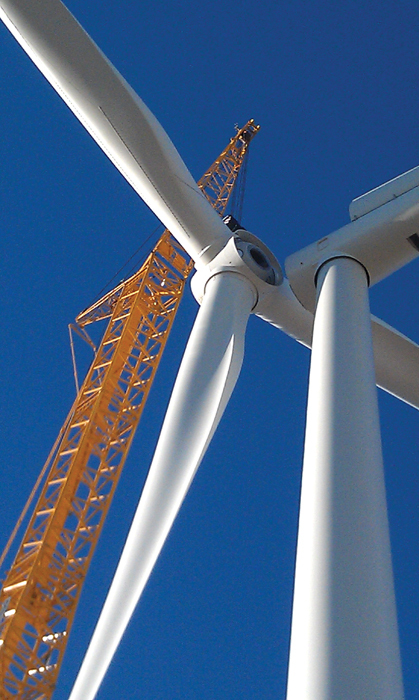 The three projects mark EDF's first entry into the Texas wind power market. When all three of these facilities are in full operation, they will be producing a total of 516 MW-enough energy to power approximately 200,000 homes. EDF intends to make use of the Electricity Reliability Council of Texas' (ERCOT) recent grid innovations. Eventually all of the Spinning Spur projects will be hooked up to the competitive renewable energy zone's new transmission lines. Since this is Texas, it's no surprise that it's one of the largest-ever programs of its kind, with the 345kV lines able to deliver about 18 GW of wind energy from five zones in the state. There is one more larger-than-life element to the Spinning Spur wind project, and that is its well-known backer. Internet giant Google invested $200 million in Spinning Spur I and, in a company announcement, explained why they get behind projects like this. "In addition to creating more renewable energy and strengthening the local economy, they also make for smart investments: they offer attractive returns relative to the risks and allow us to invest in a broad range of assets. "We're also proud to be the first investor in an EDF Renewable Energy project that is not a financial institution, as we believe that corporations can be an important new source of capital for the renewable energy sector." Google added, "Spinning Spur joins 10 other renewable energy investments we've made since 2010. Altogether, the renewable energy projects we've invested in are capable of generating two gigawatts of power." In other words, that's enough energy to power Miami, Orlando, and Tallahassee, Florida. Rob Lee, Wanzek Construction's operations manager of the Renewable Team, who was involved in the pioneer project-Spur I-talked about some of the challenges of the project. Lee says Cielo (the former owner) chose EDF Renewable Energy-a company that has more than 50 clean energy projects under its belt-to be the developer. Wanzek was selected to handle the construction due to an extensive history of wind farm construction. The Cielo/EDF/Wanzek trio was an ideal team to carry out the project. "The relationship and the team effort from Cielo to EDF to Wanzek was the unique aspect about this project," said Lee. "The owner, the developer, and the contractor working together as one doesn't normally happen. It's either the contractor and the owner, or the contractor and the developer, but not all three," says Lee. "This was a good experience, where everybody got together for the greater good of the project." Since each of the companies have deep experience in the renewable energy field and the processes involved, they could focus on their strengths. For Wanzek, that meant taking care of all facets of construction. "We went in and installed the roads and foundation, erected the turbines, substation, transmission line, and everything else," Lee says. "When we're building, we also work with the landowners, to make sure they're happy, but none of the original talks or discussion goes through us; just during the construction portion." With all large-scale projects come challenges, and with Spinning Spur I, topography issues needed to be addressed. Wanzek Construction brought in its own crew on the Spinning Spur project. The crew size fluctuated some, peaking during the turbine erection phase. At the peak of the Spinning Spur I project, there were over 100 Wanzek employees and 50 to 75 subcontractor employees on site. challenges, with over an hour of travel between the two sides," explains Lee. "We had separate crews set up on both sides of the valley. It wasn't a huge problem for us, but logistically if you had to get from one side to the other, it was quite the drive." It could have been a logistical hurdle, but Wanzek made it part of the pre-construction planning process. In fact, there were very few big hiccups throughout the entire construction. Pre-planning is key, says Lee. "It is the foundation that sets the rest of the project up for success." Logistics aside, the ravine was an ideal site. "The site was flat and in a favorable location; right off the interstate, outside of Amarillo. From a construction worker housing standpoint it was a very convenient site," adds Lee. Good soil also helped to get the project completed on time. Wanzekdid have to chip away here and there, but no blasting was needed. And that also made for happy landowners. "We take great pride in being responsible stewards of the land," says Lee. "We don't own the land, but we know how important it is to make sure we treat the land with respect." Throughout construction, Wanzek employed a variety of local companies, including the aggregate supplier. "We hired as much local labor as we possibly could," says Lee. "And all of the smaller items, like the tools and consumables, we tried to get locally, which adds up to a large dollar amount by the end of the project. Also, the hotels get filled up, and the restaurants get filled up, and everybody's happy." Wanzek brought in its own crew, who are accustomed to traveling from project to project. The crew size fluctuated some, peaking during the turbine erection phase. But most of the crew was there throughout the entire project. At the peak of the Spinning Spur I project, Lee estimates there were over 100 Wanzek employees and 50 to 75 subcontractor employees. As mentioned earlier, Siemens 2.3 turbines were used, and Lee says his crew was pleased to find out they were selected. "We've put them up many times, and we love the fact that we got to put them together again. There are a lot of Siemens turbines out there. They're a good turbine." All projects also come with a looming deadline and at that time, it was a PTC deadline of December 31. After ground broke in February 2012, everyone worked hard to hit the completion date, and they were able to wrap it up on Thanksgiving Day. That gave the turbine supplier enough time to commission. "It was satisfying to finish a project of this size under a tight timeline and qualify for the PTC." The term "large project" is becoming relative, though. Despite the fact that Spinning Spur I also included a large transmission line and substation, Lee says something around 161 MW is "getting to be a fairly normal-sized project." The team approach was one that Wanzek would welcome again, and Wanzek would also welcome working with EDF again. "EDF has done many projects and that makes it easy for us to work with them. It makes it easy on us to get a pretty complicated job done and completed on time." As the Spinning Spur III wind project construction gets underway, Wanzek is following up with the final elements of Spur I, including environmental issues (like ensuring the grass is re-seeded) and handling small items that come up that are covered under warranty. The ongoing operation of the facility is handled by EDF. Currently, Wanzek is actively involved in half-a-dozen projects throughout North America. "It's a busy time of year for us, so we have projects all the way from southern Texas to Ontario, Canada." On a site that spans 28,426 acres, 70 Siemens 2.3 MW turbines were installed to produce 161 megawatts on the Spinning Spur 1 project. 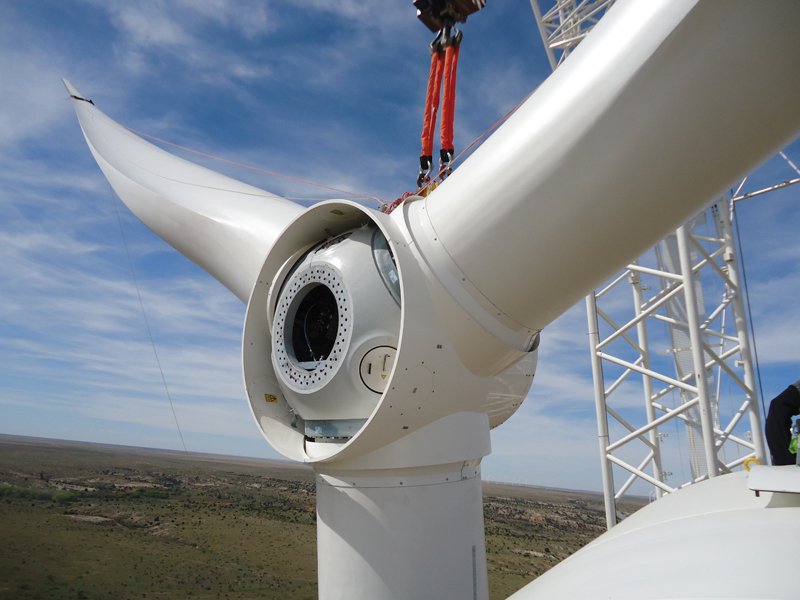 Siemens 2.3 MW turbines were also installed on the Spinning Spur II project, producing another 161 MW. Berkshire Hathaway Energy-formerly MidAmerican Energy Company-is building the largest wind expansion in Iowa's history, with plans to develop up to 1,050 megawatts of additional wind generation in Iowa by the end of 2015, and Wanzek is involved with that project. As part of that project, Berkshire Hathaway Energy has an agreement with EDF Renewable Energy for the acquisition of the 250-MW Lundgren wind project site. In addition, Berkshire Hathaway Energy's existing Vienna wind farm in Marshall County, constructed in 2012, is being expanded by 44.6 megawatts (the Vienna II wind project). The Lundgren and Vienna II wind projects will both be constructed by Wanzek. Wanzek Construction is headquartered. Wanzek has done a number of projects in the Dakotas and Minne-sota. "When we can get a wind farm in our backyard, that's obviously nice. We have a lot of people who travel all over for us-a lot of them from this area. So it's great when we can get a project in the Minnesota or North Dakota area." There is also something great about traveling, though. "We've been to a lot of interesting places, like Alaska, Pue to Rico, up into Ontario, and Texas--North Dakota and everywhere in between. I like the fact that we get to go to so many different places." Lee also enjoys the Wanzek work environment. "We're still relatively small compared to large construction companies. We're more tight-knit, and everybody knows your name." Although they may not be the largest company out there, they can still handle any Texas-sized construction project. 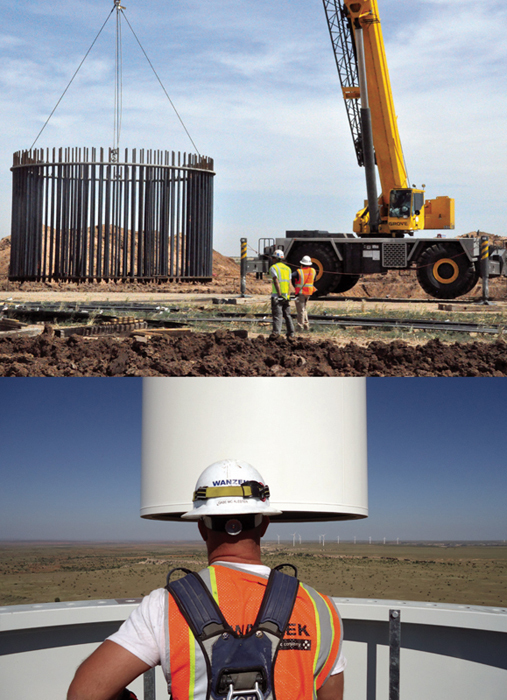 "We have the capabilities to perform any size wind project-big or small-efficiently, safely, and with a high level of quality. What made Spinning Spur I a good fit was the collaboration effort the entire team had to complete this project on time and successfully."